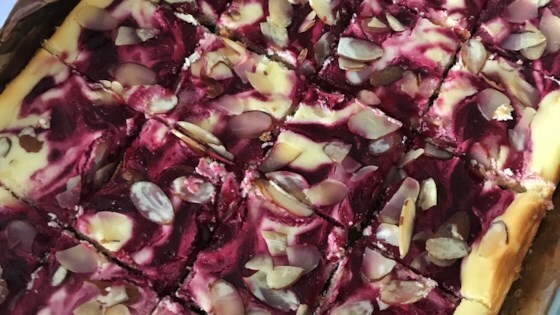 "Delicious cheesecake cookie bars with a hint of almond flavoring, swirled with simple homemade cranberry sauce and topped with sliced almonds. Easy to make and perfect for any event!" Fresh or thawed frozen cranberries would work in this recipe. Substitute 2 tablespoons water plus 2 tablespoons raspberry liqueur for the 1/4 cup water, if desired.